A Barnsley Historian's View: Did you know Miners were sold Surplus Army Rations in 1947? Did you know Miners were sold Surplus Army Rations in 1947? I'm at my Mum's for the weekend, we try to visit every three weeks or so and I don't generally take my laptop with me as it seems rude to work whilst I'm visiting, however as this is a long weekend and the OH is otherwise occupied I managed to carry a bag of stuff for the weekend and the computer on the long journey via the X19 bus from Barnsley to meet Mum at the Hare and Tortoise at Parrot's Corner, Rossington. It seems this will be the last time I will do this too - the X19 will terminate in Doncaster from September and I'll have to change buses, so I might as well catch one all the way to Bawtry and make Mum's journey to pick me up shorter. After a visit to the Retford Bookworm (a rare independent bookshop with a large second-hand section at the back) this afternoon where I couldn't resist several WW1 books, I was reading out a paragraph to Mum this evening about people now not having much idea about the kind of thing soldiers in WW1 had to endure. I mentioned rations ... and Mum suddenly remembered that after WW2 her father, a Colliery Manager, was able to get hold of a box of surplus army rations, which were being distributed to all miners. She particularly remembered the chocolate and estimated it must have been 1946 or 1947 as she had been around 8 or 9 years old and living in Spennymoor, County Durham, by then. There were some brief reports of this in many newspapers, this is the best article I could find. From the Yorkshire Evening Post dated 17 April 1947. All underground miners are to be given a chance of buying one of 750,000 surplus Army ration packs, free of points and coupons. They are to be sent to mining areas under arrangements of the National Coal Board and the National Union of Mineworkers. They will cost 30s each, but 7s 6d is returnable if the container in which the rations are packed is brought back whole, and 6s if the lid is broken. The 50 cigarettes which are part of the pack will be a post-Budget bargain. Other contents are tins of bacon, vegetables, tins of fruit, soap, sweets, matches and tea. The container is made of wood with a tin inside. During the war packs of this type were dropped to isolated troops. In December 1947 some articles appeared in newspapers reporting the distribution of the packs. I found one in the Yorkshire Evening Post dated 22 December. Packs of food marked "Pacific", now being distributed to Yorkshire miners for Christmas, are surplus Army emergency rations identical with the standard packs issued to troops in Burma during the war. Each pack contains sufficient food for six men for one day, besides cigarettes and sweets. During the week-end clerks at many pits in the Doncaster area assisted in issuing packs to miners on payment of 22s 6d. Another item from the Dundee Courier dated 24 December. 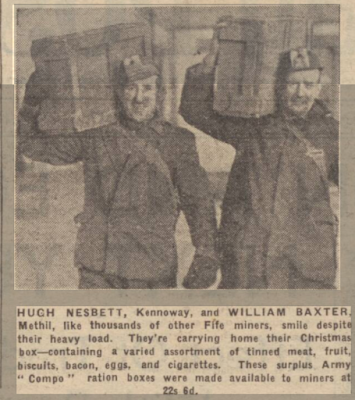 Fife miners were offered 20,000 Christmas boxes yesterday. Costing 22s 6d (or 30s with the case) they contained ham, sugar, butter, tea and cigarettes. Before the parcels were handed over, each miner was asked to sign a declaration that he would not resell the contents. Surplus army "compo" rations, samples had been tested before being distributed to collieries. And finally, the one picture I could find, which is from the Sunday Post, a Glasgow newspaper, dated 28 December 1947. "Hugh Nesbett, Kennoway and William Baxter, Methill, like thousands of other Fife miners, smile despite their heavy load. They're carrying home their Christmas box - containing a varied assortment of tinned meat, fruit, biscuits, bacon, eggs, and cigarettes. These surplus Army "Compo" ration boxes were made available to miners at 22s 6d." My Mum was pleased I'd been able to find proof of her memories. She said that the tinned fruit would have been a special treat. My next task is to check the Barnsley Chronicle to see how the distribution of the boxes was reported in our area. That will have to wait until next week though. There you go Mum, especially for you! Very interesting, thank you for sharing, Linda.